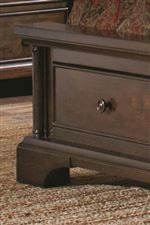 The rich mocha brown knotty alder finish of this chest makes it a beautiful and luxurious place to store and use your media. 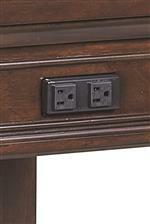 Two top drawers flip down to turn the piece into a desk or to give you easy access to media players, and the second drawer has HDMI/RCA/AC outlets to charge your devices. 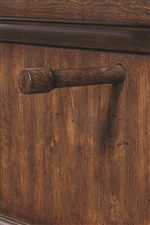 A cedar-lined bottom drawer keeps your belongings fresh and pest free. 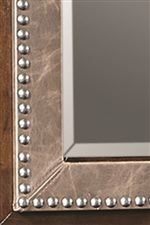 Supported by elegant bracket feet and decorated with oil bronzed hardware and a simple, elegant mirror decorated with bonded leather and nail head trim, this piece will be a stately addition to your bedroom. The Bancroft 4 Drawer Liv360 Entertainment Chest and Bonded Leather Portrait Mirror by Aspenhome at Walker's Furniture in the Spokane, Kennewick, Tri-Cities, Wenatchee, Coeur D’Alene, Yakima, Walla Walla, Umatilla, Moses Lake area. Product availability may vary. Contact us for the most current availability on this product.